9PM - It's Miss Kane's Birthday, and as a member of FOKK, I'm obligated to be drinking many a beer with her at the Surly Goat! 10:00AM - I'm demanding my breakfast in bed! Maybe I'll go sleep over at Kristany's house instead. She seems to wake up to gourmet breakfasts every day. 10AM - Because clearly I'm becoming a Farmer's Market whore... I'm throwing this on my weekend docket. I'd like to think that I'm going to wake up early enough to get some fresh sea urchin... but after an evening out in Downtown with Kristany Dyakostica & his Gay Cowboy lover, I'm not sure how coherent I'll be at 10AM. All in all, I'm taking it pretty easy this weekend... considering being on antibiotics + lack of alcohol, leave very little to do. 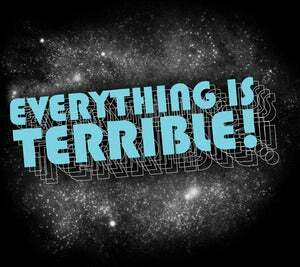 Everything Is Terrible! presents Everything Is Festival!